For those who missed it the first time around, or those who want to hear it again, the “Theology In Action” episode of the School of the Americas vigil is now available archived online. Lot of hard work went into it and we’re proud to present this episode of Theology In Action, and we’re hapy to present it to you any time you’d like. Thanks to everyone who donated to make the show possible and to everyone who listened in. Rev. Tess Baumberger of the UU church in Medford invited me to take part in this year’s MLK church service. As part of it, we presented an interweaving dialogue “unpacking” racial identities and backgrounds. It made for a very powerful part of the service. I posted my side of the dialogue on my own blog, but it doesn’t do it justice until you have both together. The Reverend and I have been in contact and we are publishing our words together, although on different sites. Here on this blog is the interwoven version. I am adopted and claim all the nationalities of all my parents. Puerto Rican, and Jewish of Russian/Polish descent. others are best assessments from forms I can gather. before the trail runs cold. I have lived my whole life on land wrested from American Indians. Ireland, France, England, and Bohemia. along with sauerkraut and sausage my grandpa Lahr made. that, his love of singing, and his sense of humor I think comes from the Irish. but my Bohemian grandmother loved to tease, play games and make kolatches. If I want to I can trace all these lines back several generations. from 25 years in three of the five boroughs of the city. a rarity in this denomination. I grew up on a a family farm in eastern South Dakota. I was raised Catholic and attended Catholic schools through high school. and one of this sisters was a Benedictine nun. I discovered Unitarian Universalism when I was 32 years old. My parents were both highly educated people. mainly Portuguese, for most of his adult life. but never used her degree in her career. and eventually municipal union District 37 from where she retired. and the only one of the nuclear family without a college degree. and have taught adult education ed at colleges. But you would never know this by my appearance. and who loved classical music. and who loved opera and literature. (she introduced me to George Elliot and Virginia Woolf). The artist now works at Home Depot, the historian at Walmart. and the other works in construction. They are both adopted. My youngest brother is a quarter Oglala Sioux, now we say Lakota. My niece’s father was from the Crow Creek tribe of the Lakota nation. you cannot see by looking at my face. and a masters of divinity. of worn down Beatles albums and Broadway soundtracks. but because of my skin color it can never be called privileged. yet when I look at my hands, I know they were not. you are “less than” if you are colored. she was noted as Hispanic. that has faded from the Northern Great Plains. We had a close network of neighbors who helped each other through crises. Both of my parents worked, my siblings and I did from a very young age. Even so, we squeezed in lots of television time. There I saw the first man walk on the moon, Nixon resign from office. during the time of Vietnam, Women’s Lib, and the Cold War. My parents taught us we are all God’s children, equal in God’s sight. the privilege I have because of being born white. David: Because I am a person of color: While I know I’ve always been hired based on my ability, I can never be 100% sure ethnicity was a consideration. David: While I know I’ve never not been chosen for a job because of my race, I can never be 100% sure. David: When asked to speak publicly, I know it will be based on my ability and knowledge, but I can never be 100% sure if it’s not to speak on behalf of my entire race. David: I have been followed around by security in store in a neighborhood I lived in for years. Tess: If my kid acts up in school it won’t be attributed to his race. surprised when not every person mentioned is of color. Tess: If my child should ever be arrested and found guilty of a crime, he is likely to find legal representation, and receive a fair trial and fair sentence. artists of color because they will otherwise not be represented or recognized. Tess: I most likely will never be asked to speak on behalf of my entire race. Tess: I won’t be harassed if I try to vote, no matter where I live. Tess: Nothing less than desirable in the way I dress or act will be ascribed to my race. but not given the privilege to accept or reject all the negative aspects of them—deserved or undeserved. I am multi-racial and multi-ethnic, and racism affects my spirit. they are built into the system and have infiltrated our culture. I am white. I am European American, and racism affects my spirit. I have mixed feelings about this idea. For those who don’t know, the hashtag comes from a group of clergy that object to the Florida police using mugshots of black people for target practice. They tweeted photos of themselves instead of mugshot photos of black males. I am gad that clergy are trying to do something to bring attention to this and try to change minds and behaviors. The problem is I don’t think this will do it. I haven’t seen many black faces among the clergy photos, which tells me this isn’t a good idea among black clergy, if anything because they know that they would be targets for the police when not in priestly garb. Having white clergy substitute their photos once again puts white people in charge (or the saviors of) a problem for the black community. And as a friend pointed out, why are we encouraging the police to use people—any people—as targets anyway? The meaning behind the hashtag was with good intentions, it just wasn’t thought out to the full conclusion. School of the America program airs Today! This was a photo of my favorite guy at the SOA vigil in November. 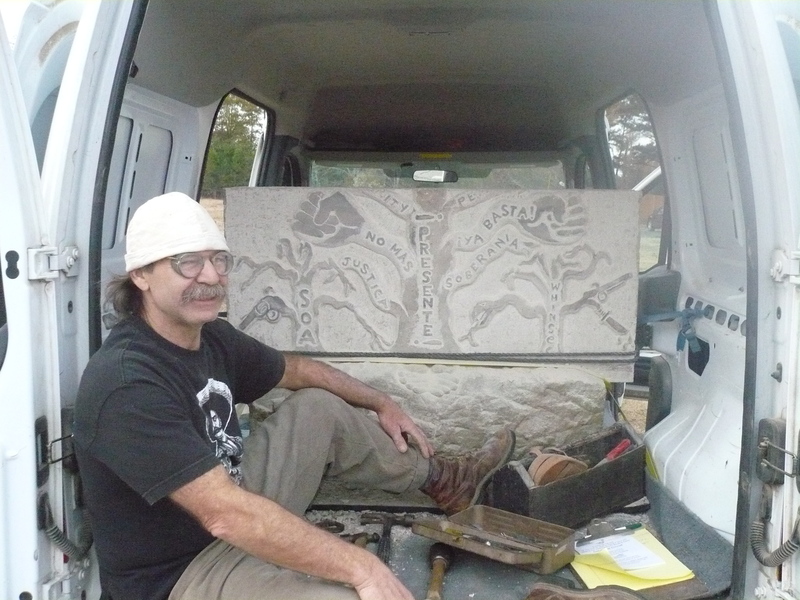 He spent 2 weeks carving this out of a granite block taken from a closed down Virginia national bank. It has a carving on the other side too, but I don’t have a shot of that (damnit!). Today on this Martin Luther King Day, the radio program about the SOA vigil is on today at 3pm EST. Tune into the show at www.activatemedia.org. Lot of hard work went into it and we’re proud to present this episode of Theology In Action. Tune in today at 3pm and enjoy!! Got a couple of quick updates about the radio show. First, the show about the School of the Americas vigil is scheduled for Monday, January 19, which is the observation of Martin Luther King Jr. day this year. It seemed entirely appropriate to do a show about a human rights vigil on the day we honor a famous human rights advocate. So hopefully you will be hearing more about the show in the weeks to come as we get closer to the date. Second, I am in the process of getting a bunch of my past shows archived and available to listen to online via a Dropbox link. We had one show posted on this block a few days ago. Here’s a second one from earlier in the Fall. I spoke with two of the activists who helped with the Million Mask March in DC (and other cities in the US and the world) and was one of the better shows of the year in my opinion. Check it out on the link below.